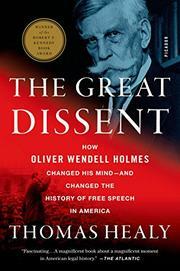 The writings of Supreme Court Justice Oliver Wendell Holmes are the basis of today’s interpretation of freedom of speech, but it took many great minds to convince him of its value. Seton Hall Law School professor Healy tells the engrossing tale of how it happened. In his debut, the author traces the evolution of Holmes’ opinion away from the view that you may say what you like, but you will be liable for prosecution. Holmes could not accept that the right of free speech was absolute, and he sought to define its limits. Those who influenced him were the best intellects of the time, including Justice Louis Brandeis and future justice Felix Frankfurter. The author deftly follows the progression of Holmes’ changing view without descending into incomprehensible legalese. Justice Learned Hand’s decision in Masses Publishing Co. v. Patton (1917) was the first step in convincing Holmes that unacceptable views could be tolerated, and Harvard instructor Harold Laski, as near a son as possible, was the greatest influence on the justice. Laski, along with Zechariah Chafee and Herbert Croly, were in the vanguard of those who fought against the persecution of dissenters instituted by the Espionage Act of 1917 and the Sedition Act of 1918. These two acts produced the cases that would completely change interpretation of the First Amendment. Holmes’ opinions, especially in Schenck (1918), show his growing recognition that only a “clear and present danger” can curtail freedom of speech. It was when he wrote his dissent for Abrams (1919) that he truly outlined the free marketplace for ideas and defended our right under the Constitution to express an opinion. An exceptional account of the development of the Constitution’s most basic right and an illuminating story of remarkable friendships, scholarly communication and the conservative justice who actually changed his mind.